PEOPLE have been flocking to sign a special book of condolence at Derry's Guildhall in memory of the late Bishop Edward Daly whose funeral takes place in the city tomorrow. Families from Derry, Donegal and further afield are joining world political and religious leaders in remembering the late bishop's work both in helping to bring an end to 'the Troubles' in the North. He will also be remembered for his role in tending to the seriously ill as chaplain of the Foyle Hospice. Mayor Hilary McClintock signing the book of condolence at Derry's Guildhall. The much-loved cleric died after a long illness on Monday, August 8, 2016 at the age of 82. 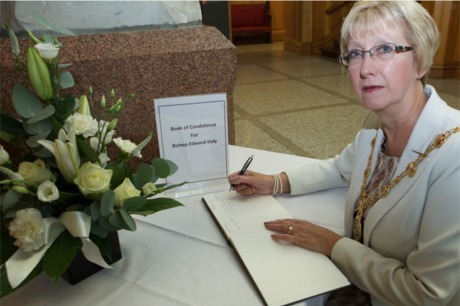 As well as the traditional book of condolence, Derry City and Strabane District Council have also established a dedicated email address where people can record their tributes if they are unable to attend the Guildhall in person. These will all be included when the book is presented to Bishop Daly’s family. Derry Mayor Hilary McClintock, said: “Bishop Daly touched the lives of many people here in the district and I know they will want to share their thoughts and memories with his family." Anyone who wants to include a message in the digital Book of Condolence can click here .